Improve your handling and get rid of that unsightly fender gap with a new set of KW coilovers for your BMW F83 M4. The BMW F83 M4 owners have been anxious for a coilover set-up to hit the market. KW got on this right away and was able to be the first manufacturer to introduce the all new KW V3 & Clubsport Coilovers for F83 M4. The KW Clubsport coilovers are designed to provide BMW drivers who want the maximum potential from their new M4 Convertible on racetracks as well as on the street. KW Clubsport coilovers have been developed on the Nürburgring Nordschleife and allow separate adjustment of the rebound and compression similar to our Competition racing dampers. KW Variant 3 coilovers also offer a similar level of adjustment too. These KW Coilovers are made out of high quality stainless steel, guaranteed never to rust and perform over and over again in the harshest conditions. Replacing the suspension on your BMW F83 M4 for a set of KW Coilovers will give you total control of your handling, such as: ride height, rebound and compression. Improve your handling and get rid of that unsightly fender gap with a new set of KW coilovers for your BMW F83 M4. The KW V3 Coilovers for the F83 M4 feature all of the features of the V1 and V2 with the added benefit of adjustable compression rebound dampening for the experienced driver. 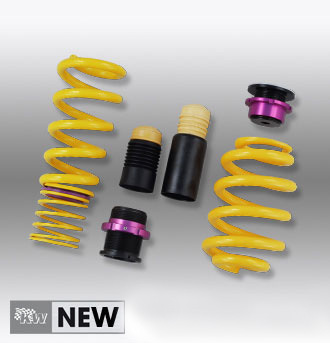 KW V3 F83 Coilovers are specifically designed the experienced driver.